I have been working with a group of very interesting people over the last 3 days producing a book that can be used for generating campaigns about Internet Literacy. We generated texts on a large and varied range of topics. More on all this later. One very interesting issue that has been more clearly illustrated for me in this process is the necessity to understand the role of templates when generating content. When I talk of templates here I mean pre-configured templates that are meant to illustrate what the final product of a chapter or ‘content unit’ should look like. I have always avoided using templates because I think it shuts down a lot of creative discourse about what the content could be and it kills those amazing surprises that can leap out of working in a freer manner. Perhaps even more importantly, templates can confuse people – sprint participants need to first just create what they know or are energised by – forcing output immediately into templates is not helpful to this process. However, I can see there is a role for templates, not as structure for the final content but as tools that can help the process of generating content. In this particular Sprint, we generated a very lightweight template before the sprint. This is something I really dislike doing for the reasons stated above but the fear was (and I think it is justified in this instance but I would want to be careful before advocating its usefulness in other contexts) that we would float too far in conceptual territory without any boundaries. We wanted very much to glue the creative discourse and thinking at the Sprint to defined actionable units (campaigns). So for this purpose after discussion with one of the initiators of the sprint we generated a very light weight template that provoked only 7 points. Really just the ‘who, what, why’ material that campaigns need to address. This was then used as a process template – a template acting as a foundation for the sprinters to define the context of their content – not a template that would become the structure for the final content. It worked very well – enabling the participants to let their creative energies flow while providing a backdrop or context within which the content needed to rest. The ‘process templates’ also allowed those who think conceptually to ‘build up’ so to speak, and those that thought in more concrete terms could also define their content. It provided a common scaffold for Sprinters to build in the direction that most interests/energises them. So while it does not change my mind regarding content templates, I think I have discovered a place for very lightweight process templates that can give some kind of framework for the participants to work with, refine, define, and fill. 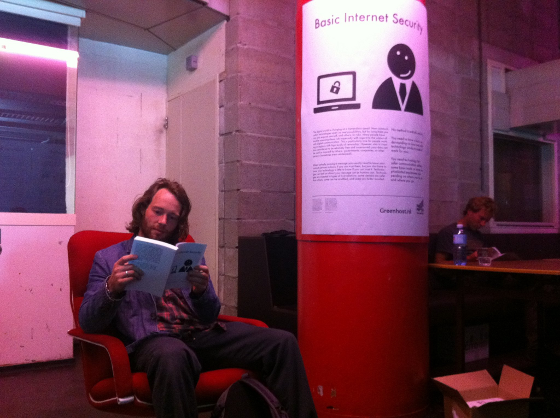 Last week I worked with a Dutch organisation by the name of Greenhost.nl. They are a small hosting provider based in Amsterdam. They wanted to bring their crew to Berlin to make a book on Basic Internet Security and they wanted me to facilitate the Book Sprint. We got a small team together and sprinted the book over four days. Started Thursday, finished Sunday. Actually one day earlier than expected. 45,000 words or so and lots of nice illustrations. The following morning, the book went to the printers and then was presented the next day in print form at the International Press Freedom Day in Amsterdam. In addition, in the links above, you may have noticed the link to a torrent file on Pirate Bay. We didn’t create this torrent – someone noticed the book, downloaded it, and made the torrent. Hence others are helping a lot to get the book out there. ..nice. Largely because of the cheapness of paper and the cultural context arising from this cost, combined with the stardard print production process, we have come to worship the book as a static cultural artifact. It almost seems to us that ‘static-ness’ is a part of a book genetics so much so that many people find it even hard to pick up a pen and write notes in the margin of books. We have forgotten that notes like this (‘marginalia’) were once very common – when paper was hard to come by, sometimes the margin notes were where books were written. There is even a science dedicated to reconstructing manuscripts (‘textual criticism’) which is in part focused on how to construct ‘the text’ from works where the author has commented-on and changed their own works via the marginalia. It is hard to call these alterations ‘comments’ since they are direct interventions by ‘the author’. In the days when margins were used for notes by both readers and writers, it was sometimes difficult for the copyists (the profession that copied books which was common before the printing press) to know which were the author’s additions and which marginalia were ‘by others’. Hence textual criticism is often focused on the arguments surrounding which marginalia should be considered part of the ‘final’ work. It would make some kind of sense that margin notes might come back into fashion since paper is so cheap that we can easily purchase clean copies of books to replace those ‘contaminated’ by marginalia. However, the choice has been to keep notes in note books, and leave the printed volume unaltered. There are a few digital projects (notably Commentpress – http://www.futureofthebook.org/commentpress/ – and some ebook readers) that enable types of margin notes. In the case of Commentpress, these notes are the point of the book – a place to start discourse (almost literally) around the book. The point is, that now, through projects like Commentpress, we are in a position where we can start to deconstruct the ‘unalterably’ of books. Ironically, we can welcome marginalia again, not because the price of paper is too high that we need to use the margins, or so low that it doesn’t matter if we use the margins – but because we don’t need paper at all. There is an interesting historical irony at play since we do not need ‘margins’ if we do not need paper. However, we can now feel marginalia is appropriate because it does not alter the source of a book. It seems we are finding ways to have marginalia that do not contribute to the book but contribute around the margins of the book. Textual criticism in a few hundred years may might be an easy job since the textual critic can just parse the margins notes out of the source. The Foundation of the Long Now might have something to say about this since they advocate that we are living in what will be known as ‘the Digital Dark Age.’ Digital data has a very short lifespan and hence the data for digital-only texts might not exist at all or might only be accessible through forensic means. Still, the point is, we are still not talking about the unalterability of books, and we do not seem to be able to move towards changing the book only working around the outlines. This remains unchallenged, even though we can ‘fork’ books (copy the entire text and work on it leaving the original unaltered) and do with them as we like (especially now that free licenses are becoming more popular). We somehow still cannot bring ourselves to consider changing an existing book. Even harder is to allow ourselves the opportunity to believe that we can improve a book. Why not? Translation is a way to improve a text. If this was not done then many texts within a single language would hardly be understandable today. Ever try and read some old English? Know what this is? ‘Our father which art in heaven, hallowed be thy name. And forgive us our debts as we forgive our debters. The first text is in middle English (which existed in the period between Old and Modern English). In effect the work has been ‘improved’ so we can understand it (not a ‘literary’ improvement as such). Translation like this is a type of re-use. You take the text and transform it into another context. In this example the new context is another time. Translation being what it is, we accept it can always be improved even though sometimes there are ‘authoritative’ star translators – people who have translated a text with such nuance that it is considered hard to improve their translation. The German translations of Dostoyevsky by Svetlana Geier,(subject of the film ‘the Woman with the 5 Elephants’) are almost considered ‘final’ works in themselves. Somehow Svetlana Geier has come to be regarded as some kind of manifestation of Dostoyevsky. Even so, her works are translations and hence it is somehow easier for us to believe we can improve these because they are not the original. So why not? Why not improve the original? Can’t we take a book, any book, and improve it? Why is that idea so difficult for us to engage with? Why is it easier for us to consider improving a translated work but not OK for us to consider improving the original? Why can we improve the work of Svetlana Geier but we can’t improve Dostoyevsky?. One part of the puzzle involves publishing and authorship of static books building a robust unalterable context for the authoritative version ie the version born from the author. We (you or I) are not that author and so we cannot know the author’s intent with all its nuances. We should not, therefore, meddle with a work because we would be breaking our unspoken contract to preserve the author’s intent. It would not be, even though we have the tools and licensed freedom (in many cases) to change, considered an appropriate thing to do. We do not have the authority to do it. The authority is inherent in the author alone – so much so that the role of the author to the book is analogue to the role of ‘god’ to its creation. The author is the creator. In William Golding’s Lord of the Flies the children use Piggy’s glasses as a magnifying glass to start a fire. However, Piggy was short-sighted and hence starting fires with his glasses would be impossible as they are concave and concave lenses disperse light. You cannot start a fire with a concave lens. And yet would we allow anyone to alter the book to improve upon what is a rather trivial fact? No. No, because the book is Golding’s world and in Golding’s world, concave lenses start fires. Golding is the creator. He has the authority to change his creation and we do not. So many layers to unravel. Let’s roll back a little to Book Sprints again – they are interesting here because the books are born from collaboration. There is no single author whose intent we need to imagine and hold dear. The authority is distributed from the outset. However, in my experience, it is still difficult to get people to cross that imaginary threshold and improve a work, even though the invitation is explicit. Many people still ask if they can improve a Book Sprinted work even though the mandate to change a work is obviously being passed by ‘the creators’ to anyone. In fact, there is no guarantee that collaborative works pass on the mandate to change. Wikipedia is an interesting case in point. Wikis and Wikipedia have managed to introduce ideas of participative knowledge creation, but, as Lawerence Liang (http://vimeo.com/10750350) has argued, Wikipedia is possibly trying to establish itself as an authoritative knowledge base which also has the effect of revoking the mandate to change as has been experienced by many new contributors that find their edits reversed. I think we will leave this all behind in time but it’s going to be a long time. All books can be improved – even the most sacrosanct literary works. This is a good example of the ways that change is often not a result of the possibilities of technology but instead a rsult of the possibilities that have been closed to us through our internalisation of old technology. We have inherited a notion of Immovable Type. The only thing that can change that is the shock of possibility, necessity, or time. I recently saw the first substantial use of Booki materials like this just last week. It occurred with the FLOSS Manuals implementation of Booki (http://www.flossmanuals.net) which is a repository for materials about how to use free software. Last week we had a Book Sprint on Basic Internet Security and we were able to import about 9 chapters from 3 other manuals totalling approximately 15,000 words that we did not have to create fresh. Of course, the material needed some work to fit the new context, but it was still a substantial time-saver and extended the scope of the book well beyond what we could have produced had we not had the material. This was really quite amazing for me to see. The idea was imagined from the moment FLOSS Manuals was built but, 3 years later, this was the first real case of substantial re-use. It takes time to build up the materials to make sense of re-use in this way, however, after 3 or so years waiting for the moment, I took a great deal of pleasure in seeing it happen for the first time. In this particular Sprint, we generated a very lightweight template before the Sprint. This is something I really dislike doing for the reasons stated above but the fear was, (and I think it is justified in this instance but I would want to be careful before advocating its usefulness in other contexts,) that we would float too far in conceptual territory without any boundaries. We wanted very much to glue the creative discourse and thinking during the Sprint to defined actionable campaigns. So for this purpose, after discussion with one of the initiators of the Sprint, we generated a very lightweight template that provoked only 7 points. Really just the ‘who, what, why’ material that campaigns need to address. This was then used as a process template – a template acting as a foundation for the Sprinters to define the context of their content – not a template that would become the structure for the final content. It worked very well – enabling the participants to let their creative energies flow while providing a backdrop or context within which the content needed to rest. The ‘process templates’ also allowed those who think conceptually to ‘build up,’ so to speak, and those that thought in more concrete terms could also define their content. It provided a common scaffold for sprinters to build in the direction that most interests/energises them. Book Sprints are not something that should involve a lot of pre- or post- production. In an earlier post, I have listed some reasons why too much pre-production is potentially harmful. Post-production is not really harmful, in fact, it’s most usually a good thing, however, it’s never a guaranteed thing and that’s the problem. If you want to finish a book in 2-5 days then you must bring the focus to the people ‘in the Sprint’ – the book will be whatever they make it. That includes the text, images, formatting, credits, chapter titles, section titles, cover etc etc etc. In a Sprint, you should never leave a task ‘to be done in post-production’. It both removes the emphasis that everything must be done now by ‘us,’ and post-production, despite goodwill, seldom ever happens. As soon as everyone walks out the door to go home, you have lost 99% of the energy and commitment from the people involved. That’s just how it is. So do not rely on pre- or post-production. Put the emphasis on ‘here-and-now’ production. If you cannot do it here-and-now with the people in this Sprint then it’s not part of the book… You will be amazed at how good a book can be and how many good decisions get necessarily made because of these circumstances.